This French Crystal Regulator Clock is probably Turn of of the Century. It is call a “crystal regulator” because it has glass on all four sides (in this case all the glass is beveled). The pendulum is the regulator and in this clock the pendulum contains two glass vials with mercury. These glass vials if damaged are now replaced with faux ones as mercury is no longer readily available. 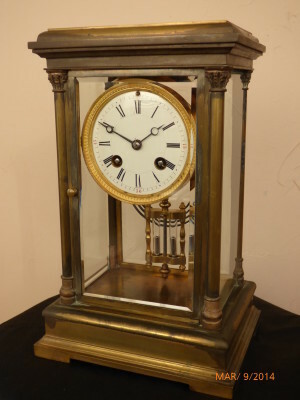 These are usually very high quality clocks with regard to their movements, but condition is very important as to their value. Many are gilded or if not, are solid brass. This one is not; it was brass plated but most of the plating has worn off which has left a nice patina, while the bezel still has the original gilding. It is an eight day clock that strikes on the half hour and strikes out the hours and keeps excellent time. 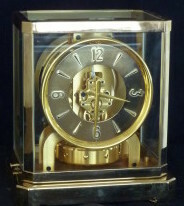 It stands roughly 12″ high which is a fairly common height for this type of clock. There are smaller ones and of course the larger and more ornate ones are more valuable, especially if they are in good condition.